In this centenary year of the end of First World War, writer, producer, Bréon Rydell, has been determined that the life and work of First World War Scottish poet, Charles Hamilton Sorley will not be forgotten. 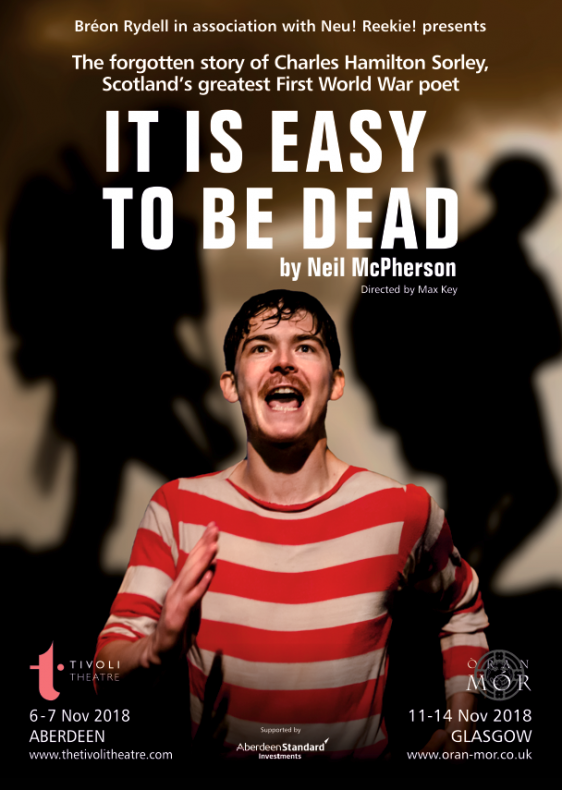 It Is Easy To Be Dead, Neil McPherson’s beautifully written and significant play opens at The Tivoli, Aberdeen on Tuesday 6 November and will be followed by performances at Òran Mór, Glasgow from Sunday 11 to Wednesday 14 November. Sorley was born in Aberdeen in 1895 and studying in Germany when the First World War broke out and was briefly imprisoned as an enemy alien. He was one of the first to enlist in 1914. Killed in action a year later at the Battle of Loos, aged 20, Sorley’s poems and letters are among the most ambivalent, profound and moving war literature ever written. His life and writings remain one of the great-undiscovered stories of the First World War. It is Easy To Be Dead is a historical drama that is both inspiring and heart-breaking. It tells the story of the poet’s life through his letters and poetry with music and songs from some of the greatest composers of the period. It is a powerful and evocative play set against the backdrop of Germany just before the outbreak of World War 1 and recounts the experiences of young Charles Sorley, who fell in love with Germany and its culture during a gap year. The original stellar cast will recreate the play and includes Alexander Knox in the title role Charlie, Jenny Lee (Janet), Tom Marshall (William), Hugh Benson (singer) and Elizabeth Rossiter (Pianist and Musical Director) and the director is Max Key. Rydell’s passion comes across clearly and in his own words: “Everyone agreed that I must produce this play in Scotland. There was never any doubt in my own mind that I wanted to bring Sorley home to Aberdeen – his birthplace. In an increasingly fragmented world, it is a play that inspires rather than divides. Mounting the play in his native land will ensure that Sorley, one of Scotland’s unsung heroes, is at last being recognised by his country.” With this in mind, Rydell enlisted the help of long-standing associate Michael Pederson at Neu Reekie, the dynamic avant-garde collective, based in Edinburgh. Rydell and Pedersen are meeting representatives of the Scottish Government with a view to championing the works of Charles Hamilton Sorley in schools.